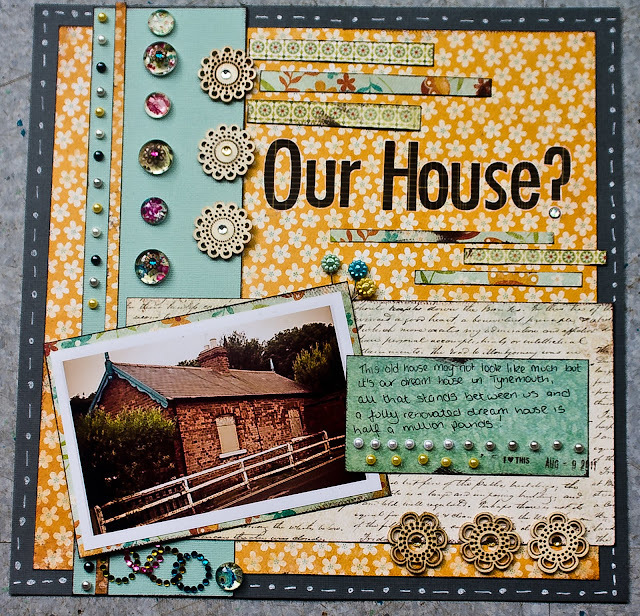 The first challenge I decided to try for Shimelles Proud to be a scrapbooker weekend was the Starting Point Challenge, it seemed to be the simplest way to get myself going as she gave a starting point and all you had to do was follow along and then after you had the same basic elements make it your own. I chose to scrap another one of my iPhone photos, now it's not usually like me to scrapbook random things instead of the kids but this photo represents a dream that both me and hubby have - the Journalling reads "This old house may not look like much but it's our dream house in Tynemouth, all thats stands between us and a fully renovated dream house is half a million pounds"
I've used the Stella Rose range of papers from My Minds Eye and added some bling, well rather a lot of it actually, Prima and Kars are the companies responsible for all of the page elements. The title stickers are Making Memories, the only thing I have no idea where they came from are those flower pins. If you haven't guessed it by now I love bling! Absolutely beautiful! I love the way the colors work together!